Are you confident that your old furnace can meet the demands of your home during the winter months? Make sure by letting our clean, screened, trained and timely heating techs perform expert Dayton furnace repair and maintenance services. Call (937) 488-4758 before there’s a problem. When your furnace breaks down, the last thing you want to worry about is dealing with an unprofessional repair company. At CJS Heating & Air, everything we do is about you. From arriving on time, to providing you with affordable furnace repair solutions, our staff always puts your needs and comfort as our number one priority. We can also help to prevent these issues from ever occurring through the use of our furnace maintenance solutions. So if you want the highest quality furnace solutions for your home, then let our company provide you with the quality that you deserve. How can you tell if your furnace needs repairs? Poor Air Quality – Do you turn on your furnace and then have a sneezing or coughing fit? When a furnace is in poor condition, it can affect the very air in your home. This can cause health concerns and deterioration in your home, which can be very damaging to you and your family. High Energy Consumption – A furnace that is not properly maintained, is a furnace that is working inefficiently. This can translate into higher than usual electric bills, which no homeowner ever wants to deal with. With a system in proper care and maintenance, this will never be the case. Difficulty Starting – Does your furnace turn on but then quickly turn of? Does the system turn on and off throughout the time it is supposed to be heating your home? 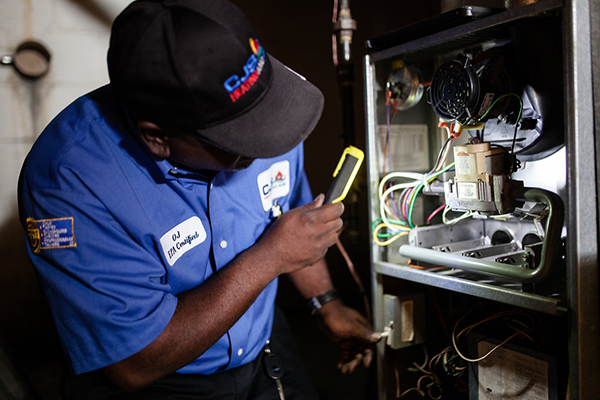 Fluctuating power is a clear sign that your furnace is in need of repair services. Strange Noises – If your furnace is making strange noises during operation then there may be a mechanical issue in your furnace. Grinding, clunking, squealing, and any other noise outside of the normal operation noise, should always be looked at to prevent any major emergencies. When these problems start to crop up in your home, then it is time to give our professionals a call. At CJS Heating & Air our services are all about you. We arrive quickly and get to work to help repair these issues in your home. Once we are done with our furnace repairs, you will have peace of mind knowing that your system is in the best shape possible. Most homeowners will never think about their furnace unless there is an emergency. With that being said, emergencies can be completely avoided through regular maintenance. When you work with our professionals, you will rest easy knowing that your furnace is properly maintained. From cleaning the unit, to making minor repairs as needed, our Dayton furnace maintenance solutions are the very best. Also, these services can be scheduled in advance to ensure that you never miss an appointment again! At CJS Heating & Air, our number one priority is you, the customer. When you choose us for your home heating and cooling needs, we go above and beyond to make you our customer for life. Our furnace repair and maintenance solutions are the best in and around the Dayton area. When you need us most, we will be there to help you. Day or night, weekends and holidays, our professionals are here to provide you with expert furnace repair and maintenance solutions. With our thorough inspections and high quality repairs, your home will be comfortable and warm in no time! Looking for a Dayton furnace repair and maintenance specialist you can rely on? Call (937) 488-4758 and schedule an appointment to get the very best furnace solutions from the very best specialists in and around Dayton.